The Cheers bar at Faneuil Hall in Boston is getting a military makeover that will see its walls decked with patches, command coins and other mementos. 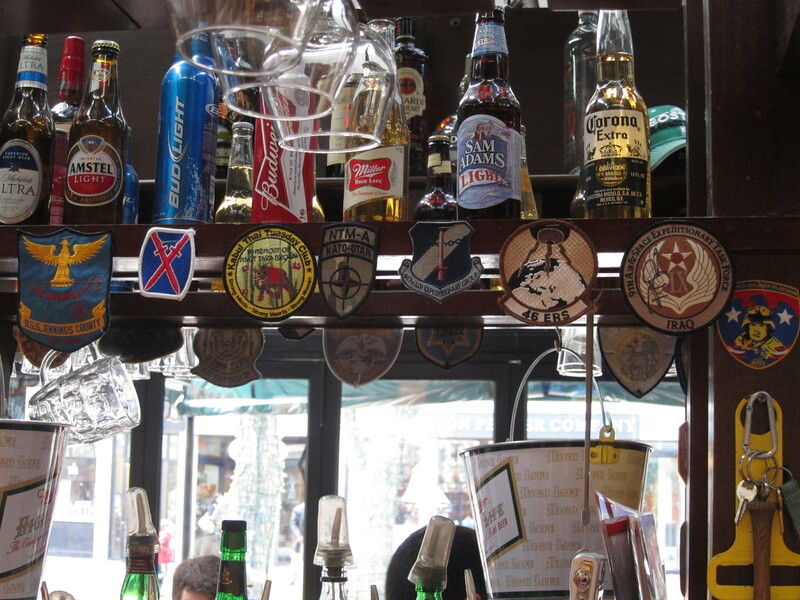 Bar management recently began tacking up unit patches and added command coin cases they are now working to fill as part of an initiative to transform the bar into a veteran-friendly watering hole. The original Cheers location, formerly known as the Bull & Finch Pub, which inspired the hit 1980s TV sitcom, is similarly regaled with law enforcement paraphernalia. The Faneuil Hall project is the brain child of medically retired David Perinchief, a combat wounded Marine veteran who served in Iraq and Afghanistan and now works for the Military Order Of The Purple Heart at the regional Veterans Affairs office in Boston. His office has helped more than 2,400 veterans navigate the often complicated VA medical claims process. Whenever a veteran he was working with would have a bad day or need to decompress from dealing with the stress of filing their first claim, he would head across the street with the veteran to Cheers for a break. After several trips to the bar, he realized it was the perfect location for veterans to unwind, engage in cathartic conversation and even mingle with civilians to share their stories. Even those suffering from Post Traumatic Stress should feel at home in the family-friendly establishment, he said. To get the project off the ground, Perinchief partnered with Tamber Norton of the Adopt-a-Soldier Platoon; Robert Bell, a combat wounded Marine veteran with the Military Order of the Purple Heart; and Cheers staff and management, including manager Philip Varcholik and retired Navy petty officer first class-turned-bartender Andy McDonald. 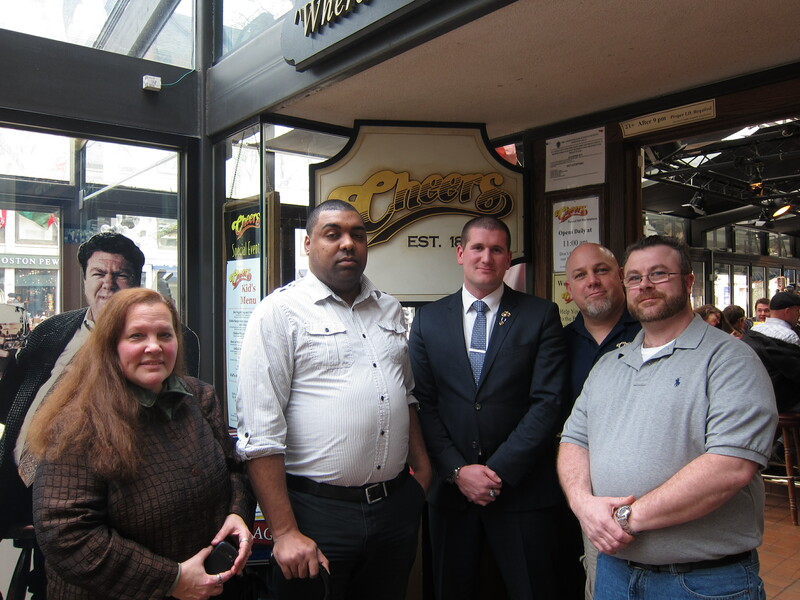 From left to right: Tamber Norton, Adopt A Soldier Platoon; former Marine Robert Bell, Military Order Of The Purple Heart Administration; former Marine David Perinchief, Military Order Of The Purple Heart Service Officer; retired sailor Andy McDonald, Cheers bar tender; and Philip Varcholik, bar manager. Coins and patches are already flowing in, but they are hoping more veterans or active duty members will continue submitting items. 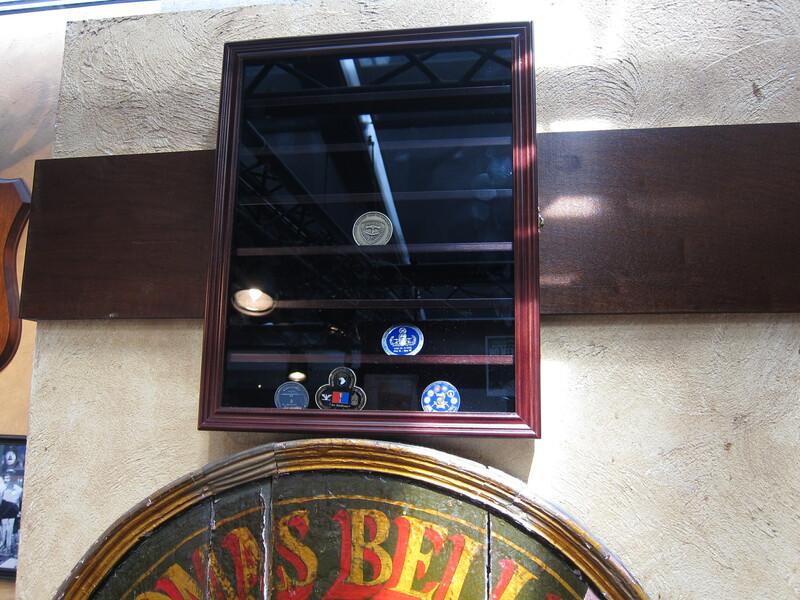 Those who would like to see their units’ coins and patches on display can either drop by the bar or mail items to P.O. Box 6358, Boston, MA 02114. Because Cheers at Faneuil Hall is a family establishment, no sexually provocative or overly violent paraphernalia will be displayed, but the vast majority of unit logos make the cut, Perinchief said. To help kickstart the effort and as veteran outreach, Adopt-a-Soldier Platoon is hosting a March 29 Cheers to the Troops reception and video gaming tournament at the bar from 8 p.m. to 2 a.m. Participants at the event, cosponsored by Microsoft and EA Sports, will have the opportunity to face off on Xbox 360s while playing Medal of Honor series games. Prizes will include Xboxes and Kindles. All are welcome, not just veterans and active duty. Tickets are $30 and can be purchased at www.cheersbostonstore.com. More than 95 cents of every dollar the organization raises go to building troop morale primarily by shipping food, electronics, equipment and comfort items to units in the war zone.